Every road engine, be it traction engine or automobile, must be provided with some sort of device to enable one of the drive wheels to turn faster than the other in turning a corner. If this were not done, the inner wheel in turning a corner would have to slip because the outer wheel has so much farther to go, being on the outside of the circle. This slipping, in the case of an automobile, would wear the tires badly and in the case of a traction engine it would throw very heavy strains on the gearing and rest of the machinery, owing to the weight of the engine and the grouters with which the road wheels are provided to keep them from slipping. The mechanism which allows one of the drive wheels to move faster than the other is called the differential gear and sometimes the compensating gear, either term being used to mean the same thing. 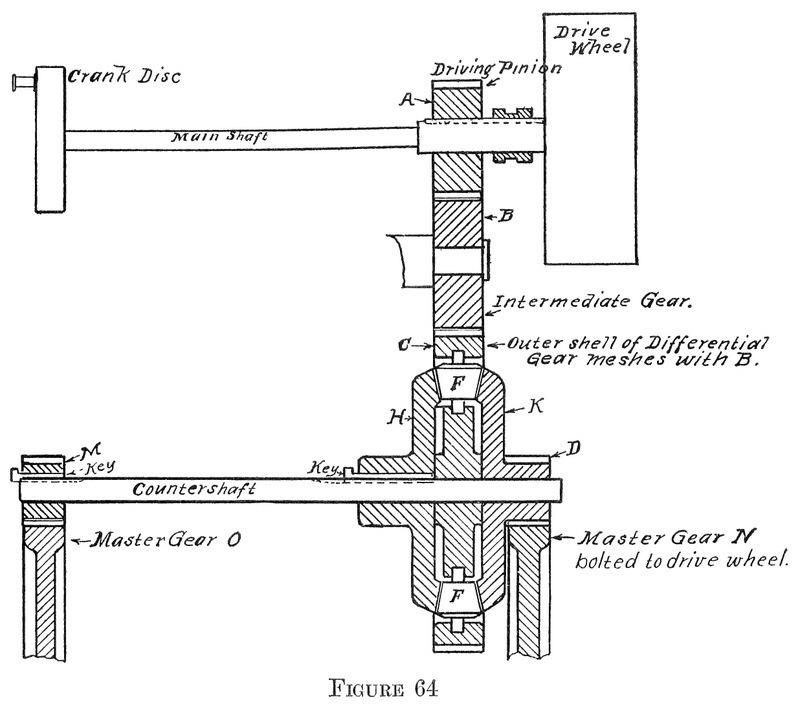 In order to describe the construction and operation of a differential gear, constant reference must be made to the accompanying illustration, Figure 64, which shows the main shaft and counter shaft together with all the gears of the driving mechanism in their proper relative positions. The figure is not drawn to scale and is intended merely to illustrate the arrangement of the mechanism, rather than the proportions. Power is transmitted from the main shaft to the drive wheels through the train of spur gears shown in the drawing. These consist of a driving pinion, A, intermediate gear, B, differential gear, C, master pinion, D, and a master gear. The driving pinion does not revolve with the main shaft excepting when the engine is moving on the road. When necessary to put the traction wheels in motion it may be locked to the main shaft by means of the friction clutch. The intermediate gear, if there is one, is attached to a stub axle bolted to the side of the boiler. All this gear does is to bridge the gap between the driving pinion and the differential gear. This latter gear is attached to the counter shaft and instead of being a single gear as the others above mentioned, it is an aggregation of gears, consisting of first an outer ring or drum with teeth on the outside which mesh with the intermediate gear. Between the hub and the outer rim there are a number of bevel pinions, marked F, in the drawing, which are attached to and revolve with the outer shell C. These pinions are also free to revolve on their own axis. Two bevel gears, H and K, one on each side of the large gear, C, mesh with the bevel pinions. The inner gear, H, is keyed to the counter shaft, while the outer one, K, runs loose. The hub of gear K is made long and is provided with teeth, thus forming the master pinion D. The companion driving pinion, M, on the opposite end of the counter shaft is securely keyed in place. When both road wheels, N and O, meet with the same resistance, as in traveling along a straight road, the whole differential gear revolves as one gear, transmitting equal driving power to both road wheels. If gear M, however, were lifted off the ground it would meet with no resistance, while O, being still on the ground, would meet with considerable resistance. Under these conditions the pinions F would revolve and cause bevel gear K and spur wheel D to revolve, thus causing the master gear N and its road wheel to revolve, while the counter shaft and the road wheel O remain at rest. On the other hand if O were raised from the ground and N met with resistance, the pinions F would again be set in motion causing gear H to revolve and with it the counter shaft and road wheel O, but since bevel gear K is loose on the shaft it will not turn and so the wheel N will stand still. In going around a curve the inner wheel does not have to travel as far as the outer one and so meets with greater resistance. Consequently the bevel pinions in the differential gear revolve a sufficient amount to enable both wheels to travel the required amount without either slipping. If one wheel gets in the mud where it does not meet sufficient resistance, the one on hard ground will stand still, while the one in the mud will revolve rapidly and dig deeper without moving the engine. In order to overcome this difficulty some provision is made either to lock the differential so that it must act as a solid gear, either with a pin or ratchet, or to lock both drive wheels to the axle, in case the engine has a through axle. Care must be taken to unlock the differential or the rear axle before turning a corner. If this is not done great strain will be thrown on the differential which will almost certainly result in broken pinions. There is no side thrust on the gears, as is the case when bevel gears are used, and consequently not so much strain on any part of the differential gear. The action of this type of differential is exactly similar to that of the one just described and a careful inspection of the drawing should make its construction and operation perfectly plain to the reader. Automobiles, generally, and some makes of traction engines, are provided with a differential gear having spur pinions instead of bevel pinions. These spur pinions mesh with an annular gear, that is, a gear having teeth cut on the inner surface. The action of a differential gear of this kind is exactly the same as that of the one just described. The claim of superiority made for the differential gear with spur pinions is that there is no side thrust on the gears as there must be where bevel gears are used, and consequently there is not so much strain on any part of the differential gear. On the other hand, it has the disadvantage of working with a master gear of relatively small size which makes it difficult to proportion the other gears in the driving train to the best advantage in traction engines. There are three kinds of belts in common use, leather, rubber and canvas. Leather has been used since very early times, but rubber and canvas have come into use within comparatively recent years. Ropes and chains are used also to transmit power, and within the past few years metallic link belting has come into use for some kinds of work. The threshermen, however, are interested directly only in the three kinds first named. The best leather belting is made from the backs of the hides of steers. Cow hides do not make first-class belting, although considerable quantities are worked into the inferior grades of belting. Figure 65 illustrates a skin after it has been tanned. The middle portion, E, F, G, N, cut from the middle of the back, is used in making what is known as strictly short lap belting, and is used in the highest grade goods. The parts outside of this middle portion are used for belting of inferior quality. The stock cut from the neck is uneven in thickness and stretches unevenly. It is not suitable for belt stock. Single belting is made from a single thickness of skin. To make a long belt the strips of leather are glued together. Care is taken to make the belt perfectly straight. If it is only slightly crooked it will never run straight on the pulleys. Double belting consists of a double thickness of skin glued together. When made in this way the hair or smooth sides are brought to the outside. In transmitting power by means of belting, the friction of the belt on the pulleys is the working principle made use of. It has been found by experiment that the softer and more pliable the belt, the better it will grip the pulleys and the more power it will transmit without slipping. The hair side of the belt should always be run next to the pulley because, being smoother, it presents more surface in contact with the pulley and hence will transmit more power without slipping than if put on the other way. A belt put on in this way will last longer because the short non-elastic fibers are brought to the inside where they are under compression instead of tension when bending around the pulleys. If they were on the outside away from the pulley and under tension, the belt would be liable to crack. Tests made by running a belt, first with the hair side next to the pulley and then with the flesh side, show that the former method will transmit twenty-five per cent more power. The tensile strength of leather belting is very variable and ranges from two thousand to five thousand pounds per square inch of cross section. That is, a belt one inch square, or what is the same thing, one-fourth of an inch thick and four inches wide, will break under a load of from two thousand to five thousand pounds. The lacing, or point at which a belt is joined, is the weakest part unless the belt is an endless belt. That is, one that is glued together. Glued belts can be used only in connection with an idler pulley or belt tightener to take up the stretch. New leather belts always stretch more or less and it is a good plan when starting a new separator to cut the belts an inch short and then as they stretch take up the slack. It must not be forgotten that a large part of the difficulty experienced with grain separators is due to loose belts. If a belt anywhere on the machine slips, the part that it drives is running at a relatively slower speed than those parts driven by tight belts. Now every part of a separator is speeded at exactly the right rate and if a belt slips anywhere, the result will surely be trouble for the operator. When straw clogs on the racks or the tailings augur becomes choked, the cause can generally be traced to a loose belt which drives these parts too slowly. As a rule it is not a good plan to use belt dressings, especially those that are sticky or gummy. If a belt is kept at the right tension and is soft and pliable, it is in the best possible condition to do good work. Melted beef tallow put on lightly and then allowed to dry makes a good dressing. Neat’s-foot oil on hard dry belts is also good, as is also castor oil. In any event care should be taken not to use very much oil or the belt will stretch and become dead and flabby. Belts should be kept dry. Rains or heavy dews are bad and cause the leather to become hard and brittle. Care should also be taken not to stretch the belts too tight. This puts a heavy strain on all bearings and upon the pulleys, which can result only in heated bearings and a gradual getting out of line of the whole machine. Probably as much damage is caused by an over-tight main drive belt as from any other thing about a threshing rig. The engine is often backed into the belt until it shows hardly any sag. The amount of strain on the bearings under these circumstances is simply tremendous and is sufficient to squeeze out all oil between the shaft and the box. The result will almost surely be a hot box. In fact, the writer has seen the cylinder box on the belt side of a separator melted out from just this cause. The horsepower a leather belt can transmit depends upon three factors: the speed at which the belt runs, its thickness, and its width. If the speed of the belt is doubled, it is able to transmit twice as much power. Likewise, if its width is doubled it can, at the same speed, transmit double the power. Doubling the thickness, on the other hand, increases the power the belt is able to transmit one and seven-tenths times. A rule usually given for the horsepower a leather belt is able to transmit is as follows. A single leather belt one inch wide, traveling one hundred feet per minute, can transmit one horsepower. This assumes that the arc of contact that the belt makes on the smaller pulley is equal to 180 degrees, or half the circumference of the pulley. Working on this basis we have the following Table III which represents the power which belts of different widths can safely transmit when the velocity is one hundred feet per minute. The following problem will illustrate the use of the table. A double leather belt eight inches wide passes over a thirty-six inch pulley, which makes 350 revolutions per minute. What power will the belt transmit safely? Solution — The speed of the belt will equal the rim speed of the pulley. Every time the pulley revolves, a point on the rim will travel a distance equal to its circumference. The circumference of a three-foot pulley is 3×3.1416, which equals 9.4248 feet. 9.4248×350 equals 3,298.88 feet, the speed of the belt. In round numbers the belt speed is 3,300 feet per minute. From the table we find that an eight-inch belt traveling one hundred feet per minute will transmit 1.241 horsepower. Then at 3,300 feet per minute, it will transmit 33×1.241, which equals 40.95 horsepower. Canvas belts, often miscalled Gandy belts, are used very largely for main drive belts. They are much cheaper than either leather or rubber and give very satisfactory service. They are first woven from strong cotton yarn. The webs are woven in lengths of six hundred feet. A separate width is woven for each width of finished belting, that is, a twenty-four inch width for a four-ply, six-inch belt; a thirty-two inch width for a four-ply, eight-inch belt, and so on. This insures two selvedge edges on each piece of duck, which enters into a belt. After the duck is woven, it is folded and then stitched, the rows of stitches being one-fourth of an inch apart, except at the splice, where they are one-eighth of an inch apart. When the web is folded over four times, making four thicknesses, the belting is said to be four-ply; five thicknesses, five-ply, etc. After the belt is stitched and spliced, making it endless, it is covered with self oxidizing oils until the canvas is saturated. After this it is hung up in dry sheds and allowed to dry, during which time the oil oxidizes. After the drying process is completed it is taken down and given a coating of paint which generally consists of iron oxide and Venetian red. After a final drying, it is ready for the market. The oils and paint fill the duck and prevent it from taking up moisture. Belts made in this way are more suitable for severe weather conditions than leather belts. The strength of the duck from which canvas belts are made is said to be about three hundred fifty pounds per inch of width for a single thickness, thus making a four-ply canvas belt considerably stronger than a single leather belt. Rubber belting is first made of a rather loosely woven cotton duck, after which unvulcanized rubber is squeezed in between the meshes of the cloth. The web is then folded and, the rubber is vulcanized. Rubber belting when well made is very serviceable for out of door work. It is not quite as strong as canvas stitched belting and will not bear such rough usage. Belt Fastenings — There are several different ways to fasten the ends of a leather belt together; as for example, lacing, gluing, and by the use of metallic fasteners. All of these methods are in common use and all of them are satisfactory under certain conditions. Lacing is used more widely than any other method, principally for the reason that it is the most convenient and easiest method that we have. There are quite a good many ways of lacing a belt to make a satisfactory fastening. There are, evidently, judging from the appearances of many belts in use, a great many people who do not know how to perform the operation correctly. This article is intended to show several simple methods of lacing, both narrow and medium sized belts, in a good workman-like manner. Many people seem to think that the lacing should be thick and heavy in order to make a good job. This, however, is a mistake. The thinner the joint, if it is made correctly, the better it is. A thick, heavy lacing strains the belt in passing over the pulley and causes slippage, for the reason that only a few points are in contact with the pulley at the instant it is passing over. The first thing to do is to cut the ends of the belt perfectly square, using a square in order to make the angle right. Then the holes should be punched with the right sized punch, that is, with one that will not remove any more leather than is necessary to allow the lacing to pass through without tearing the belt. An oval punch held lengthwise of the belt is the best form of punch to use. The holes should not be nearer than three-quarters of an inch to the sides of the belt, nor nearer than seven-eighths of an inch to the end that has been cut off. The holes in the two ends of the belt should laid out so that they match each other exactly. Then when the tension is applied to the belt, the two ends will be exactly in line. 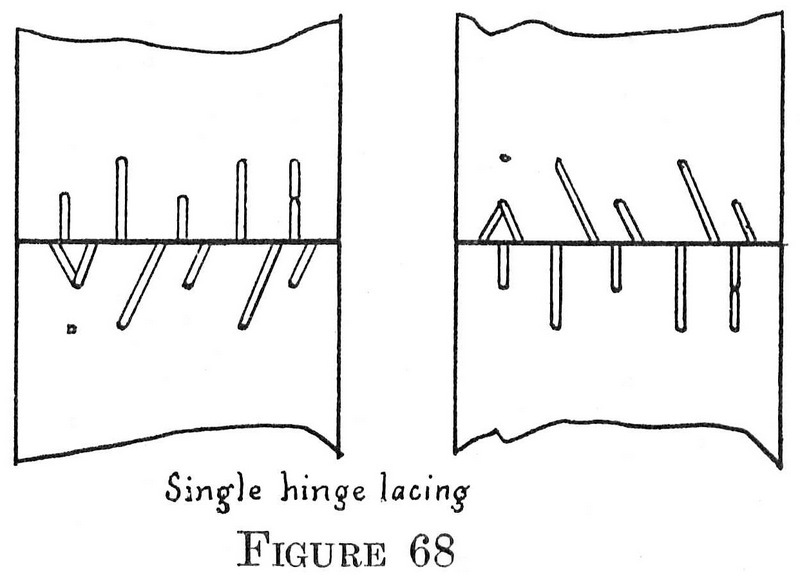 Figure 66 represents a style of lacing adapted to narrow belts that do not have to transmit very much power. The two ends of the lacing should be drawn through from the smooth or hair side of the belt. One of the laces is then laced toward the right side of the belt, and then back again to the middle, taking care to keep the strands of the lacing parallel with the belt on the pulley side, and to make all the crossings on the outside of the belt. The other end of the lace is carried to the left side of the belt, and back again to the middle in a similar manner. The laces should never cross on the pulley side for the reason that they will wear in two at the point of crossing. This lacing can be easily learned by following the figures shown on the figure; that is, start at 1 in the center, then lace through holes 1, 2, 3, etc., with the right hand lace, and do the same for the left hand. 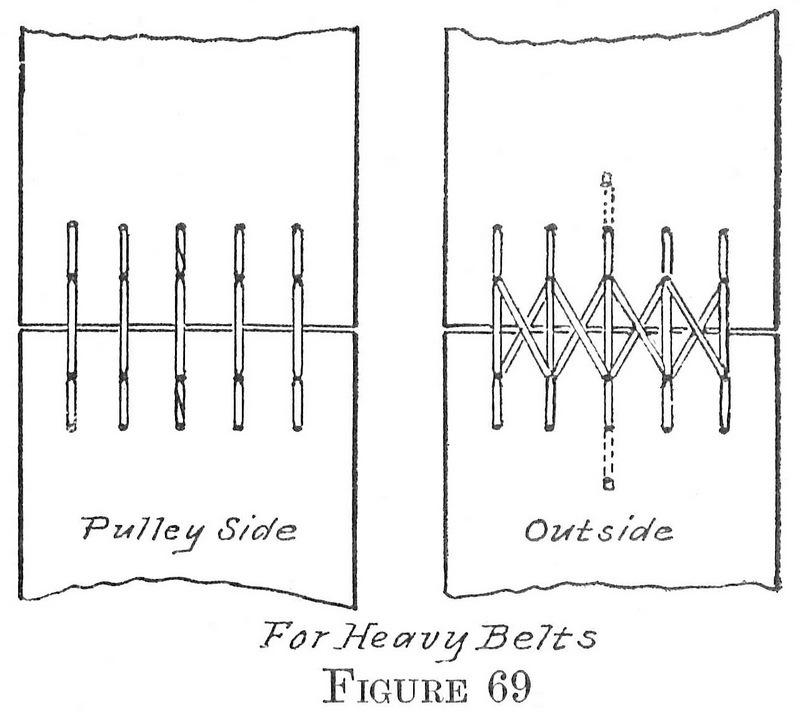 Figure 67 shows a simple method of lacing a heavier belt. The starting point is in the middle and the direction for the laces is indicated by the drawing. 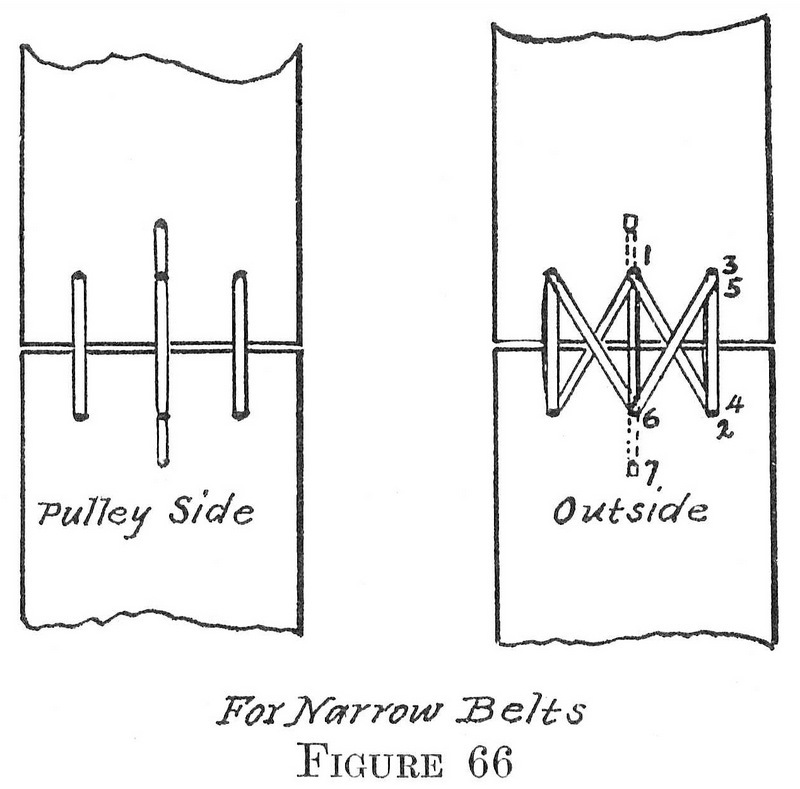 A hinge lacing suitable for a governor belt or for a blower belt is shown in figure 68. The ends of the laces in every case pass through between the ends of the belt before passing through a hole. The ends of the lacing are fastened, as shown in the figure, near the edges of the belt. This style of lacing permits the belt to pass over a small pulley or to make a short, sharp bend. It is not as strong as the other lacing shown, but it is much more flexible, and for certain purposes, as for example those above mentioned, it has considerable merit. The next illustration, figure 69, represents a style of lacing suitable for heavy belting which transmits a large amount of power. The starting point for this lacing is in the middle of the belt, one end of the lace being carried to the right, the other to the left. Care should be taken in making this lacing, as indeed with all of the others, to keep all the strands of the leather lacing at an even. tension. Whenever the lacing stretches on one side of the belt more than upon the other, either the lacing or the belt is apt to tear, and it will be impossible to keep the belt on the pulley. Belts used for driving high speed machines, especially if they pass over small pulleys, will give better satisfaction if glued together, than if laces are used. The belt being smooth at all points has no tendency to jump or slip in going over the pulleys as does a belt that is laced. Difficulty may be experienced, however, through the stretching of the belt, unless some provision is made to move the machine that is being driven, on a rail, as is generally done in the case of small electric generators, or by means of a tightener pulley which takes up the slack of the belt. 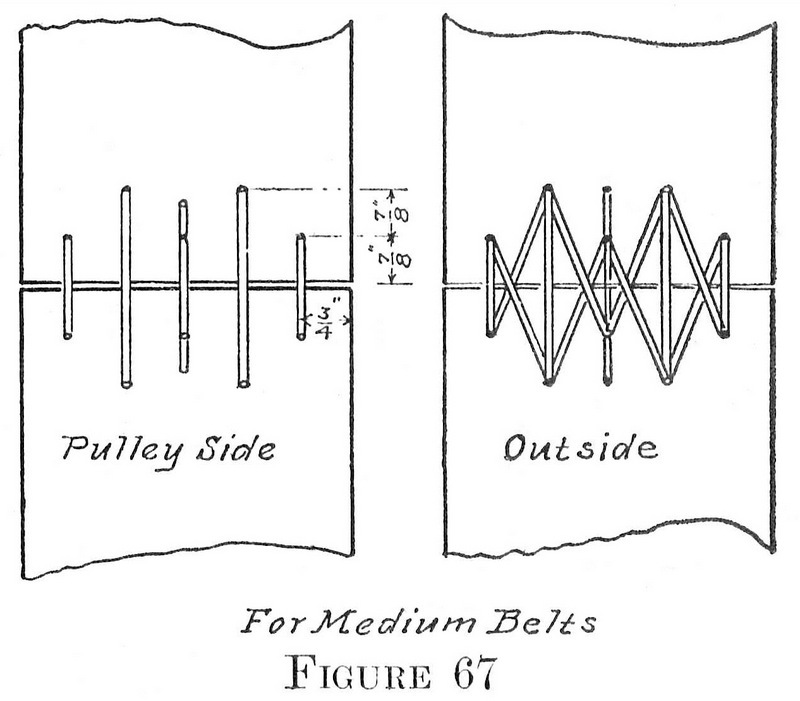 The method of gluing a belt is well illustrated in Figure 70. 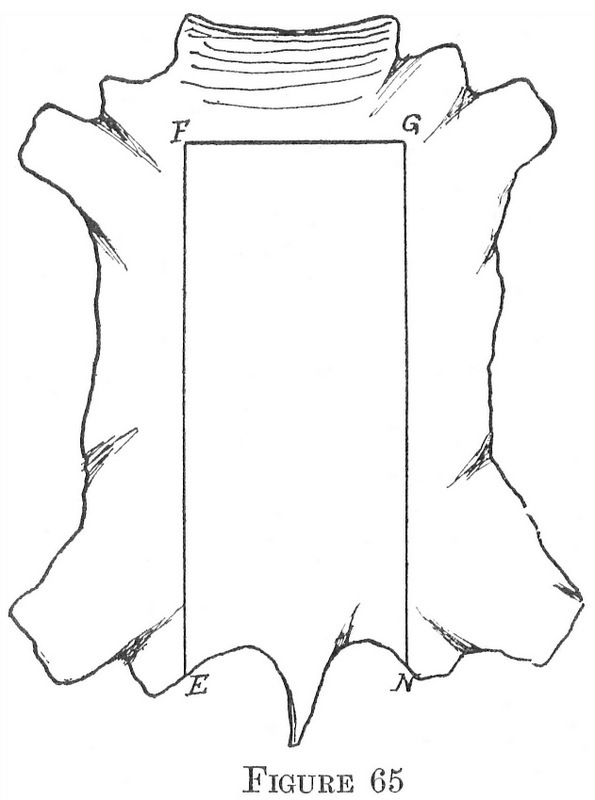 The two ends of the belt should be scarfed as shown in the illustration so that when they are laid together the thickness of the joint is exactly the same as the rest of the belt. The length of the lap should be about ten inches on all belts less than ten inches wide. The scarfing can be done with a sharp carpenter’s plane. A good grade of fish glue should be spread on the two halves of the belt, and the joint completed by clamping together between two smooth planks. The pressure should be left on about twenty-four hours. A glued belt should not be put in service until forty-eight hours have elapsed from the time of gluing. Rubber belts and canvas belts are sometimes laced, but the joint is never very strong; in fact, there is no very satisfactory method known to join these belts. If lacing is resorted to, an awl should be used to make holes, instead of a punch. A punch will cut the strands, while the awl merely pushes them to one side and does not weaken the belt at that point. Where the belts do not have to pass over very small pulleys, there are a number of special belt clamps and plates on the market that will join the belt much more satisfactorily than in any other way. Metallic belt fasteners and wire lacing are used widely on small and medium sized leather belts. These fasteners are made in a variety of forms, sometimes as staples, and sometimes in the form of a hinge with a pin: Where very heavy loads have to be transmitted, there is danger that the staples will cut through the leather. For all ordinary work, however, they are very satisfactory, cheap, and easy to apply. Pulleys — The friction between a belt and an iron pulley is much less than it is if a wood pulley is used or an iron pulley covered with leather or rope. Where considerable power has to be transmitted through a small sized pulley, it is customary to lag the pulley with leather and thus prevent the belt from slipping. It is important in covering a pulley, to draw the covering very tight and fasten it so that it cannot work loose. If it is not drawn tight, it will soon come off. Some pulleys are cast with dove tail grooves into which pieces of wood are driven. These pieces of wood hold the nails, which keep the covering in place. Other pulleys are made with several rows of holes, which are intended to receive the rivets, which hold the covering in place. If leather covering is used, it should be soaked in water for several hours before being applied. This will make the leather flexible and stretch it. The ends should then be cut square, the pulley locked in place, and one end of the lagging either nailed or riveted to the pulley. It should then be drawn tightly to the pulley and the next row of nails or rivets inserted, etc., until the pulley is completely covered. A clamp consisting of a couple of pieces of wood can be fastened to the lagging, and the pressure be applied by means of a lever over the end of the clamps and under the shaft. If the lagging is drawn up tightly and drawn in place while wet, it will shrink and become very tight when it is dry. There is much less danger of the belt slipping if the pulley is lagged, than if it is bare. Lagging a pulley increases its size and decreases the speed, proportional to the increase in diameter. Most pulleys are made crowning, that is, they are a little larger in diameter at the center than near the edges. The reason for this is that the belt is much less liable to run off than if the face of the pulley were straight. A belt always runs toward the largest diameter of the pulley; that is, if a pulley were made cone-shaped, the belt would run off on the larger side of the pulley, provided, of course, that the shafts of the two pulleys are parallel. In the case of a crowning pulley, both edges of the belt tend to run toward the center and consequently the belt has no tendency to run off from the pulleys. In order for belts to run true, the pulleys should be exactly in line and the shafts to which they are fastened should be exactly parallel. It is always advisable to run the machinery in such a way that the lower side of the belt shall be the tight side, as in this way the belt will be in contact with the pulleys through a larger arc, because the weight of the upper half of the belt which is the slack side, will cause the belt to hug the pulleys; if the lower side is the slack side, the weight of the belt will cause it to fall away from the pulleys. In figuring the speed of the pulleys, their circumferences need not be considered. All that is necessary to know is the diameters, because the circumferences are proportional to the diameters. If one knows the speed of the driving pulley, the diameter of the driver and the diameter of the follower, it is easy to figure the speed of the follower. The rule is: form a fraction with the diameter of the driver for the numerator, and the diameter of the follower as the denominator, then multiply this fraction by the speed of the driver; the product will be the speed of the follower. The statement is frequently made that the efficiency of a steam engine at its best is not more than ten or twelve per cent and that generally it is much less. If this is true it means that from eighty-eight to ninety per cent of the energy supplied is lost before any work is done. This is a tremendous loss and the reasons for it are of interest to everyone who uses steam power. The term efficiency may not be generally well understood and so we will state briefly that it means the ratio of the amount of work obtained from a machine to the work put in. It means output divided by input. Or, in other words, if we put two hundred foot pounds of work into a machine and it delivers only one hundred foot pounds of work then the efficiency of that machine is only 100/200 or fifty per cent. This definition of efficiency applies to any machine whatsoever, whether it be a steam engine, a gas engine or a jack screw. A steam engine is a heat engine. Heat is the source of its energy. The larger the engine, the more fuel it takes to run it. The engine that can deliver the largest amount of power with a given quantity of fuel is the most efficient engine. Consequently, in order to get at the ultimate efficiency of a steam engine, and this includes the boiler and all other parts, we must start at the coal pile and take into account, first, the amount of heat energy the coal contains, and second, all of the heat losses that occur before the heat of the coal is turned into useful work. This leads us then to a consideration of the nature of heat and its relation to work. To begin, heat is a condition, or effect. It is not a substance and cannot be weighed although we do have a method of measuring it, which will presently be explained. Heating a substance does not change its weight, which proves the statement just made, that heat is not a substance. Sir Humphrey, one of the early experimenters in this field, melted two pieces of ice by rubbing them together, from which he concluded that heat was caused by motion. However, it is well known that substances may be heated without moving them. Nevertheless when a body is heated there is a movement of the particles or molecules of the body because all bodies expand when heated, thus the idea of motion exists even though it be too small to be seen directly. Since heat and motion are inseparable it leads to the conclusion that heat is a form of energy because it requires energy or work to produce motion. It was suspected for a long time that an exact relationship existed between heat and work but it remained for Dr. Joule of England to discover what this relationship actually is. In 1854 he undertook a series of experiments which culminated in the discovery that one heat unit was equivalent to seven hundred seventy-two foot pounds of work. A heat unit, or British thermal unit, usually written B.t.u., may be defined as the amount of heat necessary to heat one pound of water through one degree Fahrenheit, or, to be exact, from 62 degrees to 63 degrees Fahrenheit, and according to Dr. Joule’s experiments, this represents an amount of work equal to raising seven hundred seventy-two pounds one foot high. A few years later Dr. Rowland of Baltimore found the value to be seven hundred seventy-eight foot pounds and this is the value now accepted by all American engineers and is called the mechanical equivalent of heat. To show how all of this applies to the subject of engine efficiency let us consider how the heat of the fuel is changed into work. In the first place, the fuel must be burned in the furnace, water is heated and turned into steam, which is piped to an engine and there made to push a piston back and forth. This piston in turn transmits energy through several moving parts before it reaches the fly-wheel where it can be turned to useful account. The process is a long circuitous one and inevitably there are many losses. The first loss arises from radiation from the boiler and its setting. If the boiler is in a closed room where the wind does not strike it and is well jacketed this loss may be made quite small but it is never entirely overcome. In the case of a traction engine working out of doors, it is always large. The next loss is due to incomplete combustion of the fuel. This may be large, or small, depending upon the skill of the fireman and can be entirely overcome with proper care and intelligence. Then there is a great loss of heat through the smoke-stack, carried out by the smoke. For every pound of coal burned there is required, theoretically, twelve pounds of air, but there must be a certain excess of air to insure a sufficient quantity of oxygen and generally from twenty to thirty pounds of air are used per pound of coal. Four/fifths of this air is composed of nitrogen which does no good whatever, but considerable harm, since it must be heated in the furnace and then with a large load of heat cast out through the chimney. The temperature of the chimney gases is from 450 degrees to 750 degrees Fahrenheit, and since each pound of air when heated one degree absorbs one-fourth of a heat unit, very nearly, it can readily be seen that a very large part of the heat of the coal goes to waste in this way without doing any work. This is a loss that cannot be overcome although in stationary practice it may be reduced to a minimum by using as small an amount of air as possible, and by placing a feed water heater, or economizer, as it is called, in the base of the chimney and thus cooling the gases as low as possible. To do this, however, requires an expensive equipment which is justifiable only in very large plants. It can not be done with a traction engine. The heat losses so far considered belong to the boiler only. With a poor boiler setting where the air can leak in, or where the boiler is not well jacketed, the total loss may be as much as sixty per cent or as low as eighteen per cent. The latter figure represents about the best that has ever been accomplished in stationary practice, and is much better than can be hoped for in traction engine work. This brings us now to the losses in the engine itself. The first to claim our attention arises through radiation from the cylinder and steam pipe. If the latter is long or not properly covered, considerable loss may occur at this point, or if the cylinder is not jacketed, the loss may be considerable. The great loss however, and the one that overshadows all others, is due to the heat that escapes with the exhaust steam. In order to appreciate this loss we must first consider the amount of heat that is put into a pound of steam during formation. If one pound of water at a temperature of 32 degrees Fahrenheit be heated to the boiling point it will require 180 heat units and if this boiling water is evaporated into steam at atmospheric pressure it will call for 966 heat units, additional, making a total of 1,146 heat units in each pound (per square inch) of steam at atmospheric pressure, that is, pressure that is not recorded on an ordinary steam gauge. Every pound (per square inch) of steam at atmospheric pressure contains this amount of heat, and since this is the pressure of the exhaust steam it follows that every pound of steam that escapes at the exhaust as steam carries with it this large burden of heat. Here then is where the principal loss occurs in steam engines. It is in the heat of the exhaust steam and it can not be overcome because the medium used, water, requires so much heat to change its form from water into steam, and this is practically all lost in non-condensing engines. In addition to these heat losses there must be taken into account the losses through friction in the engine itself. These losses in traction engines are never less than four percent and may range as high as twenty percent, or even more, depending upon the condition of the bearing surfaces. Counting from the coal pile and taking everything into consideration it is doubtful if a traction engine will show more than six percent efficiency under favorable conditions. This means that for everyone hundred pounds of fuel burned ninety-four pounds are lost, truly a wonderful performance; and yet it is not much worse than stationary engines of the best grade, which rarely yield more than ten or twelve percent efficiency. Under the most favorable circumstances, where every precaution known was employed to reduce losses, and with large sized high speed engines, efficiencies as high as twenty per cent have been recorded but very few steam plants have ever reached such a high standard. Considering the medium we are required to work with, namely, water, it does not seem possible to ever improve the steam engine very much beyond its present condition so far as efficiency is concerned. Let us now consider the possibilities in a pound of coal from a purely heat basis. A pound of good soft coal will yield approximately 13,000 B.t.u. or 10,024,000 foot pounds of energy. A horsepower is equal to 33,000 foot pounds per minute or 1,980,000 foot pounds of work per hour. 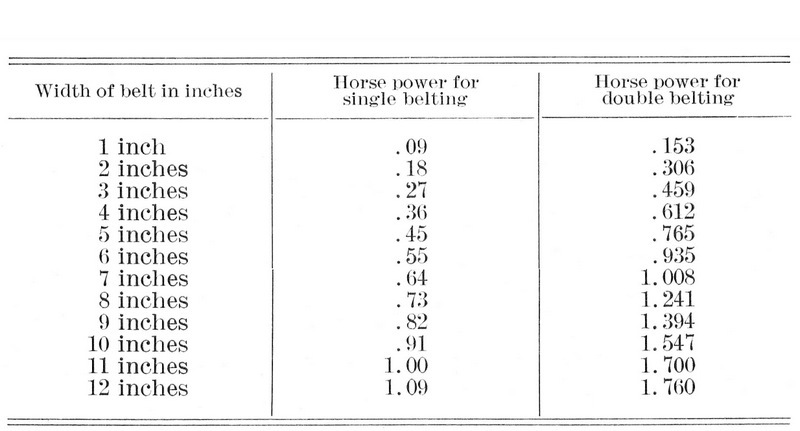 10,024,000 divided by 1,980,000 equals 5.06, which shows that theoretically one pound of good average soft coal should yield 5.06 horsepower per hour, while as a matter of fact it takes anywhere from one to six pounds of coal to yield one horsepower per hour in the steam engine. Gas engines, however, have an advantage in efficiency over the steam engine. Any good average gas engine will yield at least fifteen per cent efficiency and that too in the small sizes while the best gas engines have shown efficiencies under actual test of more than thirty per cent. The reason for this advantage in efficiency is easy to explain. The heat is generated where it is used, in the cylinder, and there are not so many chances for loss to occur. The medium used is air and no energy is required to change its form as is the case with water. True, there is considerable loss of heat through the jacket water and on account of the exhaust gases and the friction of the engine is considerably larger in proportion than in the steam engine, but its ultimate efficiency is greater than the steam engine nevertheless. Both, however, are wasteful and are depleting the world’s fuel supply at an alarming rate. The life of a traction engine all through the Northwest is, on an average, about seven years. Traction engines do less than three months work per year, or a total of less than two years of actual work before they go to the scrap heap. Some engines, it is true, last two or three times as long as this, but this fact only goes to prove, even more forcibly than anything else, that the method of handling is extremely wasteful. Each of these engines cost anywhere from $2,000 to $2,800, thus making the deterioration amount to from $300 to $400 per year. Figured on the basis of the actual work done, the deterioration is greater yet. For example: suppose the engine works eighty days per year which is a high average, and cost originally $2,800. If it lasts seven years the deterioration is $400 per year or five dollars per day for every day it runs. If the engine runs only forty days a year the deterioration is just twice as much or ten dollars per day. This amount is altogether too high, and while it is not very complimentary to say it, it is largely the thresherman’s own fault. A traction engine ought to last from fifteen to twenty years with anything like decent care. They are well made and contain the best of material. The fault lies with the user. Poor engineers, poor care, bad water and a desperate desire to keep going at all hazards, tells the story in one sentence. It pays sometimes to make haste slowly. If anything goes wrong it pays to stop and mend it even if the crew does lie idle for an hour or two. It generally prevents a worse condition a little later and is sure to make the engine last longer. If anything within reason can be done to make an engine last two or three times as long, it ought to be considered. The writer has made earnest inquiry in every business he is acquainted with to determine the amount of deterioration in equipment and he fails to find anything that can compare in any way with the thresher business as it is carried on at the present time. How long would any manufacturing business prosper if all the machinery had to be replaced every two or three years or less? Yet this is the average condition among threshermen. Can this condition be improved? Certainly. The remedy is simply better skill in handling the machinery and more intelligent care both during the threshing season and while the engine is lying idle. It may not be generally recognized, but it is a fact, that an engine standing idle, unless first put in proper shape, deteriorates almost as fast as while working. In other words, all deterioration must not be charged against the actual working time. However, if properly cared for, the deterioration during the time of idleness should be very small. Now let us consider the means to be adopted to better conditions. First, we must consider the engineer. He should be a master of his business. In addition to being a good engine driver, one who can pull up in line in a twinkling, he should know machinery, and how to take care of it. He should be a careful, painstaking, cool-headed man by nature, and have, through study or experience, learned the foundation principles of steam engineering. Running a traction engine is a trade by itself and requires a better man than for a stationary engine or a locomotive. A traction engine is a complete power plant in itself, which works under the hardest possible conditions. There are too many men rated as “cracker jack” engineers whose reputation is based solely on their ability as engine drivers. They can line up in “no time” but do not know enough about how to take care of the engine and boiler. Engine driving is a part of the business, true enough, and ability to do it well counts heavily when a big crew is waiting, but if care and management and a thorough knowledge of the engine is not combined with it, it is not enough by a long ways. It pays any man who owns a traction engine to put a really good man in charge, even if he has to pay double the usual wages. If this statement seems extravagant, think of that deterioration charge and then figure again. The next thing to be considered is the care of the engine in the field. It is the engineer’s duty to watch everything carefully and see that every part is in good adjustment. But right here a warning is necessary. It is not a wise thing to start out with a monkey wrench whenever you hear a knock or pound and tighten all the hearings. A little knock does not hurt very much, and any way, it is poor policy to try to locate anything of that sort by ear. The only sure way to locate a knock is either to see lost motion or feel it, and no adjusting should be done until it is located in this way. Then never try to take out all the pound at one time. Take out some today, a little more tomorrow, and thus let the bearing gradually adjust itself to the change caused by tightening the boxes. If all of the knock is taken out at once the chances are ten to one that the box will get hot. A good traction engineer, moreover, does not let many things get out of order very badly. He goes over his engine with a bit of waste every time it stops and wipes it up just as a locomotive or stationary engineer does. He takes pride in the appearance of his engine and while wiping up and keeping things looking well inspects every bolt and nut and detects any fault before the consequences can become serious. Threshing is a dirty business, to be sure, but a good engineer who takes a pride in his business will keep his machine looking pretty well just the same, and, by the way, a man who doesn’t take a pride in his business is a pretty poor specimen. The inside of the boiler needs just as much attention as any other part. It should be kept free from mud and scale. If it isn’t kept clean it will be hard to fire and there is danger of overheating the metal. Mud can always be washed out with a force pump and a nozzle on the end of a hose, working from the front end of the boiler back. Scale is harder to handle. Water containing scale-making substances may be perfectly clear and even sparkling. One can not tell by the appearance of water whether it is good for boiler purposes or not. Cold water is a great solvent, that is, it will dissolve most mineral substances to some extent, therefore water generally contains some of all the minerals found in the soil through which it flows, If the soil contains lime, the water contains lime, and if magnesium or alkali is in the soil it will also be found in the water. The worst substances in the water that an engineer has to contend with are the carbonates and sulfates of lime and magnesium. These form a hard rock-like scale, especially if there is mud or some other substances present. In cold water these substances are dissolved in the water, but when the water is heated to the boiling point, 212 degrees, the carbonates are no longer held in solution. When the water is heated to 280 degrees the sulfates are no longer soluble and they fall. There are a number of boiler compounds on the market that will purify water containing these substances, which, if used judiciously, will bring good results. The basis of most of these compounds are caustic soda, soda ash, and tannic acid compounds, made mostly from the exhausted liquor from tanneries. For lime water soda ash or sodium phosphate compounds are good and are safe and harmless. Kerosene is also used with good effect, both to prevent scale and to remove it. As a preventative it should be used sparingly, because it has a tendency to work into the joints and cause them to leak by dissolving out the particles of rust. A pint per day for a 25-horsepower boiler is enough. It should be introduced continuously with the feed water. To remove scale, it should be put in on top of the water when the boiler is cold, then the bottom blow off opened and the water withdrawn. The oil will settle on the scale and soak in after which some of it may be jarred loose and washed out. Some engineers drain the boiler and then when cold, build a light fire on the grates, claiming that the expansion of the metal will crack the scale loose. Care must be taken if this remedy is tried, not to overheat the boiler. There seems to be no compound that is safe to use for the alkali water found in many parts of the West. It is the substance that makes boilers foam so badly. Any acid, it is true, will neutralize the alkali, but such a remedy is very dangerous because it corrodes the boiler so badly. The best thing to do in this case is to blow off some of the water two or three times every day and so keep the percentage of impurities as low as possible. Indeed, this is a good rule to follow with all bad feed water. The steam rising from water is pure, that is, it does not contain any of the impurities that make scale. These all remain in the water, consequently all of the alkali or other impurities of all of the water fed to a boiler will remain therein unless some are blown out, and the result is that the remaining water in the boiler keeps getting more and more impure. A good rule to follow then is to blowout a portion of the water each day or, where alkalis is in the water, several times a day. At the end of the season’s run the engine should be put in shape so that it will not deteriorate much until the next season. First of all it should be housed in a good dry place. A man can not afford to own a traction engine if he can’t afford a good shelter for it. Rain or snow or moisture should not touch any part of the engine. Rust is caused by moisture in the presence of air. The boiler should be drained and thoroughly dried. The cylinder and valve should be oiled, all pipes should be drained, and the brasses removed. The packing should be removed from the piston rod stuffing box, and all the bright portions of the metal given a coating of hard oil, or better yet, coated with a mixture of white lead and tallow. The pump, if there is one, should be taken apart and dried and given a coat of hard oil. It need not be put together again until next season. Then the fire box, ash pit, and combustion chamber should be cleaned out thoroughly. It is a good plan also to paint the chimney and those parts of the boiler not covered by the jacket, with asphaltum paint. If all these details are looked after conscientiously the engine will be in good shape for the next season. A traction engine needs intelligent care all the time, if the owner wishes to make the most of his investment.